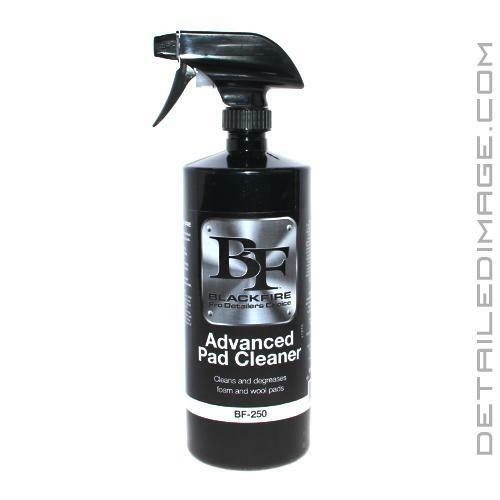 Blackfire Advanced Pad Cleaner is designed to help you clean your pads so you can keep using the same pads for years to come. The Advanced Pad Cleaner will help prolong your pads life by removing old product residue and contaminants. Your old products (ie. polish, sealant, wax) can leave behind oily residues that can affect the way your pad performs on future details, along with the lifespan associated with it. When you clean your pads their lifespan will be greatly increased and you will save money on replacement pads. Blackfire Advanced Pad Cleaner is low foaming and easy to rinse off. All you have to do is apply the cleaner, let it dwell for 30 seconds, agitate the pad with your fingers or a soft brush, then rinse off! It does an amazing job breaking down and releasing pesky contaminants that are stuck in your pad. The clean pads will look and feel like new so you can use them for years to come! DIRECTIONS: Always clean pads soon after use. Spray pad generously with Advanced Pad Cleaner. Allow it to dwell for 30 seconds. Agitate pad with a foam pad conditioning brush. Rinse thoroughly with a stream of water. I like this pad cleaner on lightly used pads. If you have pads that end up with dense product, it does not work as well. Just purchased a pad cleaner and hoping using this first will be the ticket. Haven't used it yet, but ordered it because many were complaining that the Snappy cleaner was ruining their pads. Looking forward to giving this a try soon. Great pad cleaner, works much better than Dawn. Quickly breaks down polishes, sealants, etc.